Amongst the handful of significant cartoonists that worked for Warren Publishing during the 70s, Alex Toth stands out. He created some of his best comics for the publisher, despite often working from mediocre scripts. As a rule, the best of them are the ones he did in collaboration with Archie Goodwin, but there are other notable gems in the oeuvre. 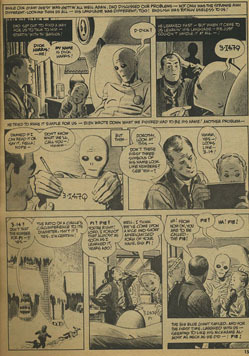 One of them is the story ”Daddy and The Pie” from Eerie #64 (1975), drawn on the basis of a well-written if somewhat banal script by Bill DuBay. The 8-page comic tells the story of a farmer’s family that one night recovers a gigantic alien, who has crash-landed his spaceship in one of their fields, and helps his recovery. A friendship develops between them and their Earth-struck guest, whom they name ’Pie.’ The neighbours, however, are not happy about the stranger’s presence, which creates rising tension in the community and culminates with Pie sacrificing himself to save the life of his host, the farmer. The narrator of the story is the farmer’s son, a little boy who finds inspiration in the examples of his father and the stranger. It is thus an almost archetypical story of friendship, sacrifice, coming of age and, especially, meeting the unknown. That the story transcends the SF element that justifies its inclusion in a Warren magazine and tells a story of fundamental human relevance is primarily to Toth’s credit. It is masterfully drawn and the storytelling is impeccable, exhibiting his usual sense of clear composition, visual cues and conceiving of the story as a whole rather than focusing unduly on individual elements or sequences. The series’ eight pages can be separated into four equal-sized sections, each consisting of two pages. The first provides the opening – the stranger arrives and is taken in by the family – the second describes the developing friendship between the family and their guest, the third delineates the escalation of the conflict between the family and their neighbours, and the fourth delivers the climax and coda of the story. 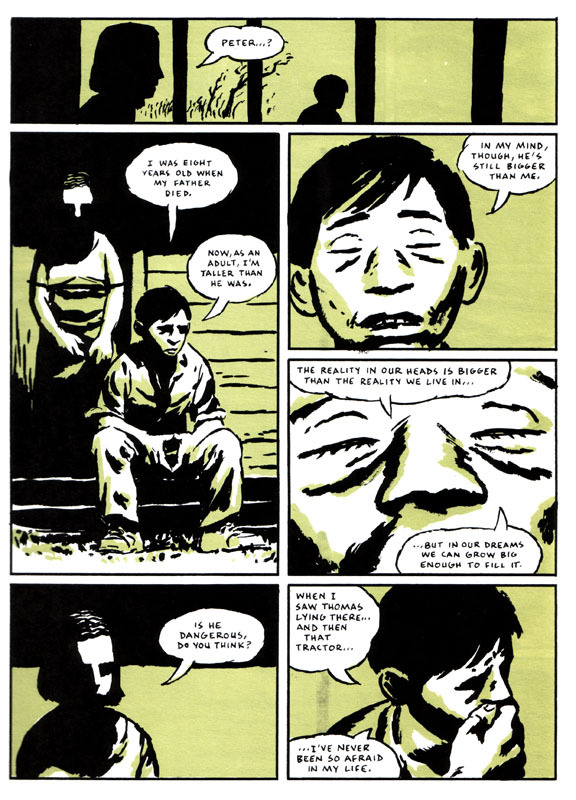 The little boy is from the outset established as the narrator, not just in the text but by his central placement, and the usage of his face, in the panels – passive, but deeply involved in the events as they unfold. It is furthermore emblematic of Toth’s subtle storytelling that the most dramatic events of the narrative happen off-panel – the explosion of the spaceship, the destruction of the village by the stranger – conveyed from the isolated viewpoint of the boy. This economy of storytelling is thoroughly characteristic of Toth; he concentrates his efforts on the most important elements of the story and cuts away the superfluous. The child’s experience becomes central. Although the scene is presented as a single, continuous dialogue between the characters, and makes use of the storytelling devices familiar to such a scene (establishing shot, shot-reverse, visual pauses, close ups, etc. ), it is at the same time obvious that the action delineated takes a lot longer than the conversation itself would. Exactly how long is hard to say, but the fifth panel shows us that it is daytime again, meaning that almost day, at the very least, must have passed. 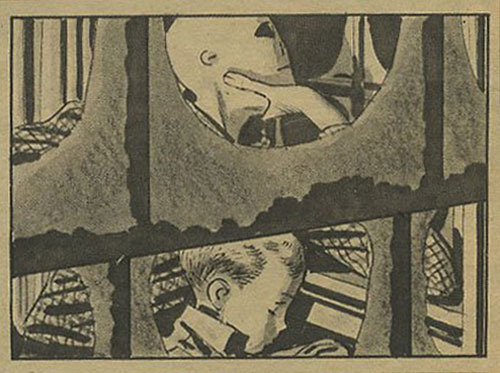 Using subtle indicators, such as the boy’s disappearance and reappearance, changes in lighting – especially between panels three, four and five – and through the exposition, Toth (and DuBay) give us a montage sequence in disguise (i.e. a sequence abbreviating the passage of time). Here, too, a farmer’s family finds a giant in trouble and takes him in, helps him recover, and has him help them out in their daily work. The 40-page story describes the moral doubts the father encounters in taking responsibility for their at one and the same time devoted and terrifying guest, ”Big Man”, and the friendship that springs up between the giant and the retarded daughter of the family. The culmination is violent, and, in contrast to Toth and DuBay’s story, it leaves the protagonists with more questions than answers. Mazzucchelli has taken the premise of ”Daddy and the Pie” and explored it in much more depth than Toth and DuBay did. Where the significance of meeting the unknown is unambiguous in their story, it is much more problematic in Mazzucchelli’s. How do you handle something at one and the same time subject to your will and so much larger (in more than one sense) than you? Friendship under such conditions is bound to be marked by a certain uncomfortable distance at the very least, which is why only the small, mentally retarded girl, Rebecca, manages to unconditionally befriend the giant. Nothing is sentimentalized in this story of power, responsibility and our relationship with nature. 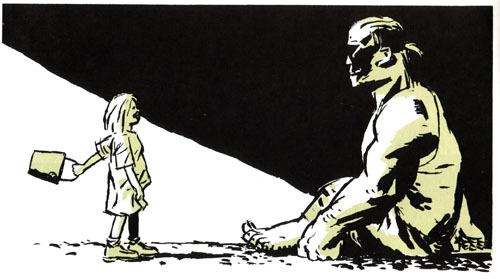 The giant is described as something bigger and more mysterious than the gentle, simple-minded freaks of cliché. The farmer’s dilemma is whether he should attempt to shoulder a responsibility that he knows he cannot carry or leave the problem to other, less understanding bodies, namely the military that he contacted at the outset and knows will come. The problem being whether he has a choice at all, a problem that haunts him because he is a moral person trying to do the right thing. The turning point of the story occurs approximately halfway through. One of the local farmers has had an accident and is trapped under his tractor. The giant is called in and reveals his enormous strength when he lifts the tractor free of the farmer. Just as Pie helps a local who has been hurt, Big Man here steps in when needed. Problems with terrified neighbours arise in both cases, but with an important difference; where Pie’s helpfulness strengthens his relationship with his host family, Big Man terrifies his host just as much as everyone around him. It is, more than anywhere else, in this scene that the inspiration from Kirby is apparent – the tilted compositions and dramatic framing of the panels, as well as the block-like, angular modeling of the figures. 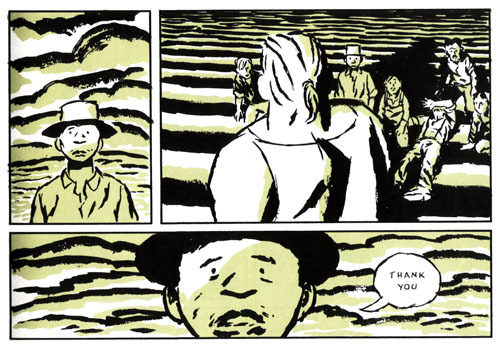 The scene that follows, however, is a fine example of how Mazzucchelli as a storyteller is closer to Toth. The sequence is a central one for our protagonist. This is where he tries to put into words the emotions we see him struggling with throughout the story. He is perhaps not entirely successful, but the sequence nevertheless works as a condensation of the problems ”Big Man” is dealing with. This is in no small part due to the way it synthesizes pictures and words. As is invariably the case with Toth, the scene is realized through a relatively spartan use of conventional storytelling devices. Two points of view are employed; an ’omniscient’ one, and one that can simultaneously be seen as the wife’s and a kind of commentary on the protagonist’s words. The former shows us the characters straight on, moving into close-up to dramatize the dialogue when appropriate. The latter, which closes both pages, shows us the farmer diagonally from above and slightly from below, respectively – in the first case emphasizing his fear, in the second his stumbling resolution. Halfway through the scene – first panel, second page – gives us a third angle, marking the wife’s intervention, further brought home by the following panel showing both of them straight on. The sequence is variegated through the interspersion of silhouettes, at the beginning, midpoint and end. The pared-down visuals and strong use of chiaroscuro – both quintessentially Tothesque elements – are essential to the mood, and support the likewise judiciously moderated dialogue. The scene gives us the essentials without it seeming abbreviated or losing its naturalism. All this only in part accounts for the its extraordinary resonance, especially when read in the context of the story as a whole. Mazzucchelli is acutely aware of the potential of the individual image as well as its role as part of the larger framework of a story. And he understands how this can be utilized to represent the complexities of life to an extent only rarely seen in the medium. In terms of content, Toth’s work, which is of course of another time, rarely attains this kind of range, but there is no doubt that his notorious unwillingness to compromise, as well as passionate belief in, and deep knowledge of, comics makes him an extraordinary example for cartoonists. 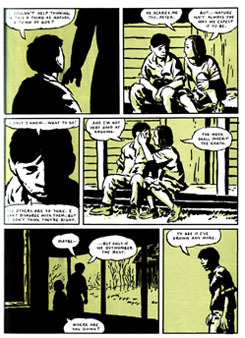 An example without which Mazzucchelli would have been a poorer artist. They both embody the exploratory artist, searching for an essence in their chosen medium. This article was written in 1999, but never published, and is presented here in its mostly unedited glory, preserving my outlook and approach of those days. The entirety of “Daddy and the Pie” can be read here.